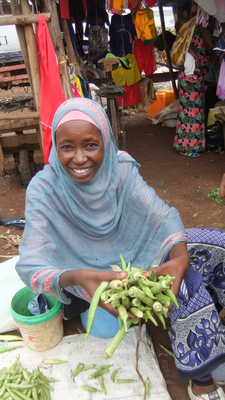 Zulea runs her vegetable business in the Ngaramtoni market on the slopes of Mount Meru. Although having to travel an hour each way from her home, Zulea prefers this market to others as it is by far the busiest in the region. She specialises in Bhindi Bhaji and green vegetables that are healthy and much in demand by diabetes sufferers (a common affliction in Tanzania). Her range varies according to the growing seasons. Her sister helps when needed and Zulea is happy that her two small children are doing well at school and that her business enables them to be well fed. Plans for the future include setting up a permanent stall in Ngaramtoni for which she will request a loan. If you would like to help support more women like Zulea, we are currently raising funds for our next round of grants and loans. To help us achieve our target you can donate here.